Appropriate Paper-based Technology (APT) cheered. Carmona trainees above, show off finished items and take to heart APT, by author Bevill Parker, British Environmentalist, which ‘’makes something out of nothing’’. Turning paper wastes/used cardboard boxes into durable/attractive kiddie table, chairs, and other utility items, this enthusiastic batch proved that with this technology, women and men with disabilities alike, even with physical impairments, could fabricate furniture/gadgets that are 1) useful 2) strong 3) costing almost nothing, and 4) attractive, which are 4 APT musts. To the beat of GangNam Style and the like, the group, some joined by their kids, gamely made group and individual projects non-stop, to maximize their 2 days. Fascinated in the end by their devices’ woodlike quality and strength, tested by some heavy weight staff, Mayor Dahlia Loyola ordered 12 sets of tables and chairs for their Reading Center. Tall order but a huge compliment to the jolly batch, including NCDA represented by Parker student at the University of London-ICH/APT trainor Nelia R. de Jesus, NCDA-TCD Chief. This ‘’paper carpentry’’ workshop was made more fun, with in-between-work energizer sign language and getting an “ECO Bag” compliments of SM Supermalls for their tools and stuff. Mayor Dahlia Loyola admires Bags for Life finished products and thanks NCDA represented by TCD Chief Nelia R. de Jesus for bringing in Bags Expert/Author Mrs. Lulu Ocampo. 20 trainees with disabilities hurdled 8 days to learn weaving “Bags for Life”, back-to-back with ‘Appropriate Paper-based Technology (APT)” to make useful devices/kiddie tables and chairs from waste cardboards and papers. 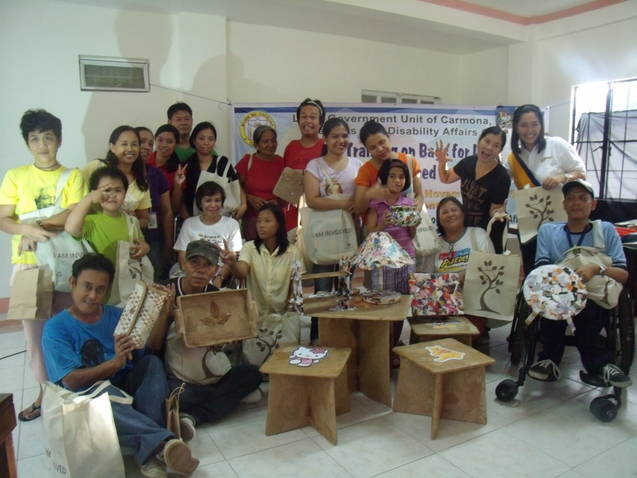 Aimed to provide Carmona’s persons with disabilities novel and practical options to generate extra income, this is also an NCDA’s pitch to enlist women and men with disabilities as environment advocates through waste reuse.